Provide a positive drive of the belt and help maintain belt alignment. Generally lower cost than pulley driven systems. Center-to-center sprocket spacing should not exceed six (6) inches. Sprockets spaced greater than 6 inches apart can cause premature belt failure due to excessive strain on the connecting rods. Under heavy load conditions, spacing should be as close as possible. All drive sprockets should be keyed in-line. Tail sprockets should have plain bores, except the center sprocket, which should be keyed to ensure shaft rotation. Plain bore sprockets should be collared to prevent lateral movement. Provide a friction drive, which evenly distributes the drive tension. Does not subject the belt to rod wear. Must be run on an accurately aligned conveyor to prevent tracking problems. Proper sprocket location is essential for smooth belt operation. Sprocket teeth must always drive against the connector rods. Drive sprocket teeth should be in the odd numbered openings and tail sprocket teeth in the even numbered openings. When mounting the sprockets, the long side of the hubs MUST FACE IN THE SAME DIRECTION. Drive sprockets cannot be located in the outside mesh openings in belt specifications S3, S7, H4 and H5. Never use tail sprockets to power another conveyor. May be supplied with cast iron and steel sprockets. Can increase sprocket life by 2-3 times under severely abrasive and heavy load conditions. Can be supplied for tail or idler sprockets to reduce shaft wear. Are press fitted into the sprocket bore. Enable close sprocket spacing on heavy load applications. Provides clearance for use with ½" x 1" modified belts. 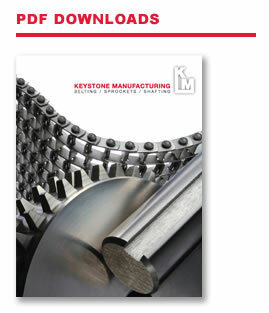 Keystone can add square bores into plastic sprockets. Bore tolerance is +0.010",-0.000'. Set screws are not included but may be furnished with an additional charge. Most sprockets can be split so the sprockets can be installed without removing the shaft. The bore size may be limited so there is enough room for the bolts to hold the sprocket together. Sprockets with an odd number of teeth are cut on two different angles to avoid splitting the sprocket through the teeth. Accurate, aligned keyseats of different sizes can be cut in any sprocket. Factory supplied keyways are accurately located through the use of a jig, assuring uniform tooth engagement. All bored and keyed sprockets are furnished standard with two (2) set screws. Standard set screw sizes are listed in the table below. However, Keystone reserves the right to change the size of the set screw without notice. 3/4 to 7/8 3/16 x 3/32 1/4"
15/16 to 1 1/4 1/4 x 1/8 5/16"
1 5/16 to 1 3/8 5/16 x 5/32 5/16"
1 7/16 to 1 3/4 3/8 x 3/16 3/8"
1 13/16 to 2 1/4 1/2 x 1/4 3/8"
2 5/16 to 2 3/4 5/8 x 5/16 1/2"
2 13/16 to 3 1/4 3/4 x 3/8 1/2"
3 3/8 to 3 3/4 7/8 x 7/16 1/2"
3 13/16 to 4 1/2 1 x 1/2 1/2"
Tolerances & Standards: for Turned Shafts and Interrupted Keyways"